In 2004 we began working with our community in creating a public information website that acts as a hub to all local entities. The idea was to centralize and link all local information through one site and bring accessibility in the homes and to the fingertips of anyone with internet access. MyMerced.com was the name given to this project for Merced, CA and its surrounding communities. Covering all areas from local sports, schools and churches to community news, events and non profit service organizations, MyMerced has been dedicated to bringing the community together and driving the internet back home. 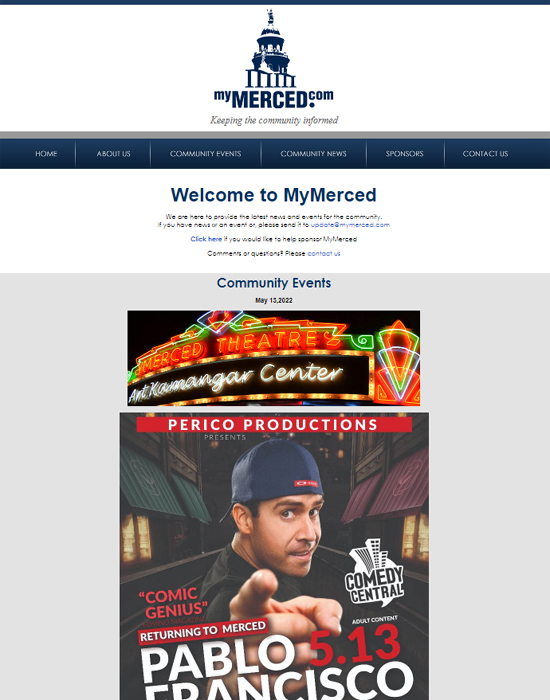 As a growing site, MyMerced is striving to be the “you name it, we got it” hub for Merced. Community involvement is key in transforming this to its full potential. The goal is to supply and direct information throughout Merced County. With features such as a Restaurant Guide, Business Directory and Shopping Guide, MyMerced is involved in helping local business thrive and build a strong local economy. A second publication in development is Agrower.com. This site will act as the hub for all agricultural activity in Central California. Covering everything from dairies and vineyards to research and tractor parts, Agrower will serve as a central information link from all agricultural entities including the private sector, state and federal agencies, and educational institutions. With the success of our first publication we are aiming to bring other communities under the same umbrella of service. But this can’t be done without your help. We are looking for a Public Relations Officer in each area that is interested in bringing their community together. Acting as a “PRO” they will manage the flow of information from local entities to Imedia West for publication. If this is something that interests you please give us a call at 209-349-8004 or email to info@imediawest.com. We would be happy to share more of our business model with you and your community. Whether you are looking for a website that is simple or elaborate, Imedia West can design a website that will make your business look successful. We're experienced in creating designs that will give your company the professional look that breeds success. Since 2001 our highly skilled artists have been creating advertisements that have appeared in such publications as AmericasMart® Children's World®, Earnshaw's, Hudson's, Kidsworld, Valley Yellow Pages and Verizon. MyMerced.com was the name given to this project for Merced, CA and its surrounding communities. Covering all areas from local sports, schools and churches to community news, events and non profit service organizations.